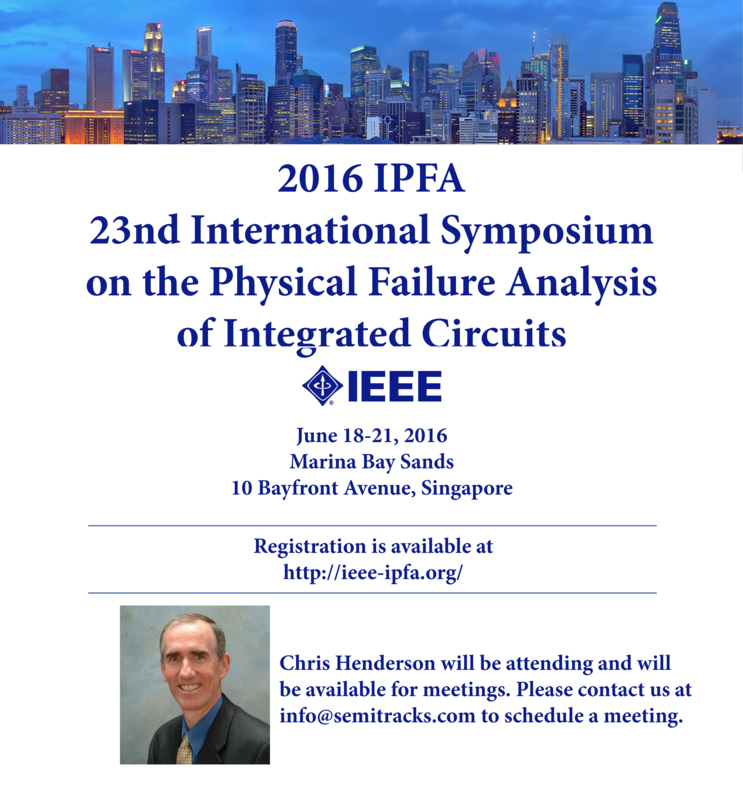 Let’s move on and discuss eutectic die attach. 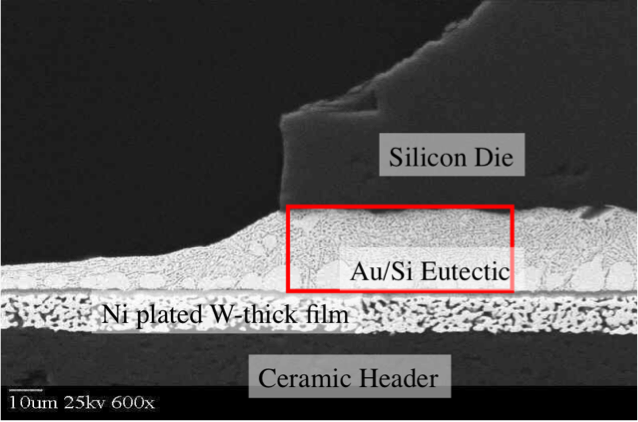 There are a number of different eutectic die attach materials; some of the more common ones include Au-Si, Au-Sn, Pb-Sn, and In-Sn. Die attach typically comes in a preform, since these materials melt at high temperatures. This image shows some examples of these die attach preforms. Eutectic die attach can be quite useful in certain applications where the application requires higher reliability. Eutectic materials are typically more stable in high temperatures, don’t have issues with outgassing, and can be picked to better match the coefficient of thermal expansion of the die and other packaging materials. Eutectic die attaches can work particularly well with ceramic packages. This provides both mechanical and electrical connection between the die and the package substrate. This SEM image shows a cross-sectional view of a gold-silicon eutectic bond. The darker dots are the silicon embedded in the gold material. Although the gold silicon eutectic process requires a higher temperature, the electrical and mechanical properties of the connection are more stable and reliable than a silver-filled epoxy bond. Gold and silicon individually each have very high melting temperatures. However, when they are mixed in the right proportions, the melting temperature decreases dramatically. 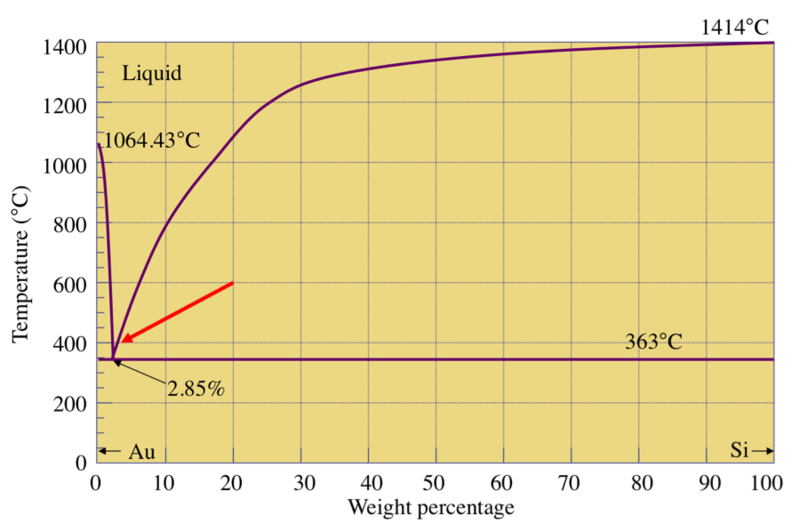 This graph shows the phase diagram for the gold silicon two-metal system. At a concentration of 97.15% gold and 2.85% silicon, the melting temperature reaches a minimum of 363 degrees centigrade. This minimum point is known as the eutectic point, or the lowest point at which the materials will remain in their liquid state. This ratio varies for different materials. However, this is low enough to work with some fully processed dice. 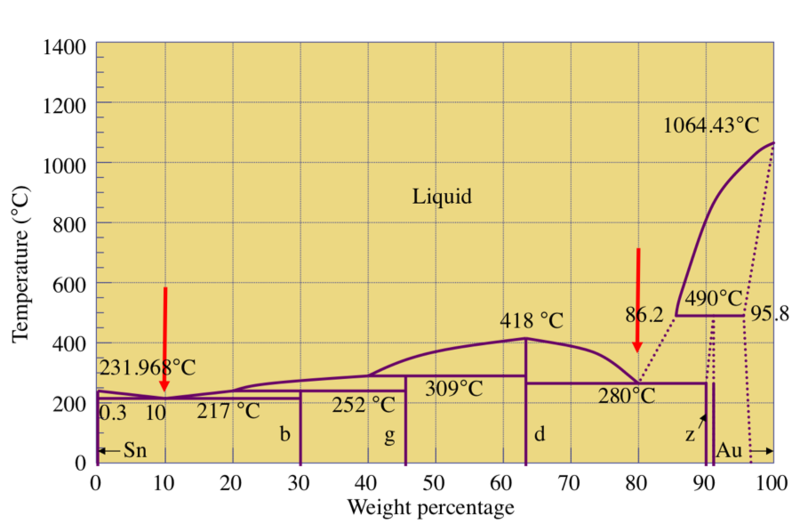 We show the phase diagram for the gold-tin system here. There are two distinct minima in the melting point. One is 280 degrees centigrade at 80% gold – 20% tin, and the other is 232 degrees centigrade at 10% gold – 90% tin. The lower temperature minimum is the one most commonly used for die attach operations, since it involves lower temperatures. Each eutectic material will have its own phase diagram and minima. One problem that can occur during the eutectic die attach process is poor wetting to the die and/or the package well. As a result, the die attach can separate from the die and the package well, becoming a loose particle. This SEM image shows an example of this. The arrows indicate the loose die attach particle. During vibration, this sliver can move and become lodged across bondwires, or the bondwires and the substrate, causing an electrical short. In conclusion, we discussed die attach materials. There are two basic classes of materials: the epoxy-based materials that use a conductive filler particle like silver for electrical connections, and eutectic materials, which rely on a minimum in the phase diagram to achieve a low temperature for attach. We also discussed some of the basic steps in the manufacturing process, as well as a few things that can go wrong during manufacturing that create failures. 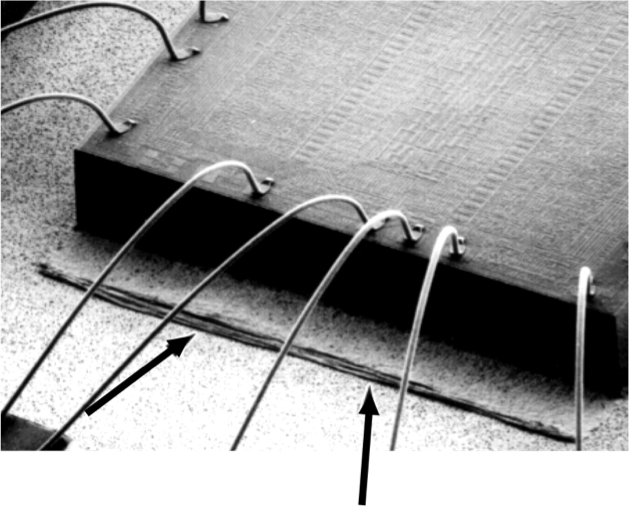 Wirebonding is, on the surface, what appears to be a simple operation. The bonding tool melts the end of the wire, presses it to the bond pad, uses ultrasonic energy to help aid in the bonding process, spools out the wire to the leadframe, presses the wire to the leadframe, uses ultrasonic energy to aid in the bonding process, sets a clamp to tear the wire, moves to the next pad, and repeats the process. In reality though, the process involves a number of variables. This fishbone diagram shows many of the variables that factor into a high quality, high reliability thermocompression bond. There are several major factors, including the environment, machine operation, ultrasonics, cleaning, the substrate, the chip, the ball size, the looping configuration, bonding force, the capillary and the wire. All of these factors must be understood and controlled to produce a high quality bond. Quite often, the assembly house will set of a design of experiments to define the impact of the variables on the overall bonding process. This data can be used to optimize the bonding process and create a more robust and reliable bond. Q: I have read that one can achieve different threshold voltage for mosfets by using different oxide thickness or different doping of source drain. However, threshold voltage depends on substrate doping, not on source or drain doping, correct? A: There are 3 normal methods for creating transistors with different thresholds. Adjust the thickness of the gate oxide. Adjust the doping levels in the channel. This is usually referred to as a threshold adjust implant. Connect the transistor in such a way as to control the body bias. Drain/Source doping would have an extremely minor effect on the threshold voltage.